For a long time–well over a year, for those of you keeping track–I didn’t think I had anything to write about. I froze up. Oh sure, I’d jot down tidbits of ideas (just like always), and later I’d try to flesh them out (just like always). I couldn’t make those ideas turn into anything, until eventually they stopped coming at all. No matter how many stops and starts and excuses I made, I couldn’t figure out why. And then it hit me. I had started worrying about my audience. Who would read it? Friends? Coworkers? What would they think? Would someone be offended? Would what I wrote be interpreted correctly? After scores of questions like that, the tiny seed of self-doubt we all carry somewhere deep inside began to grow, until finally it full-out blossomed. Not only could I not make sense out of my jotted tidbits, but I also stopped being able to find new ones. While I used to pull them out of the air like fireflies, I stopped even lifting my hand. All because I forgot that I was writing for me–not for you. And even though I said right here in this blog that I would keep writing even if not a single person reads my ramblings. And even though I’ve really, really missed this visceral part of me. So I finally started that book I’ve always wanted to write. I’ve only knocked out a couple of chapters, but it feels good. Really good. And guess what! I started seeing fireflies again. I’ve even caught a few. So here I am–right back where I started, writing because it’s my outlet, because it makes me whole. As much as I love my readers and hope that one of my fireflies will light up your life in some way, I’m doing this for me. So let me ask you this: is worrying about your audience keeping you from doing something? Maybe it’s time to go catch some fireflies. Tammy, I follow Andra as well – and she has written a great book Not Without My Father that chronicles her walk on the Natchez Trace and the time she spent with Roy (her father) that month. You really should read her book, I think you would enjoy it. We’re on the same page, so to speak–I’m reading her book now! Good for you! So excited to see your post pop up. I for one, have always felt like you always provided a firefly in my day…and sometimes more. 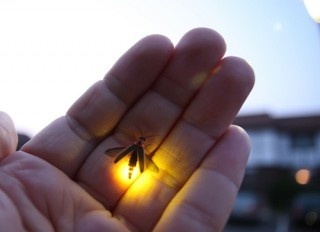 Please keep sharing your light…even when if flickers! YES. Welcome Back, Tammy! You’ve been missed. Here’s to beaucoup posts and fireflies! Hi Tammy, glad to see you back at it!